Win These Final Hours: Prepare for your last day on earth | SWITCH. What would you do on the last day on Earth? 'These Final Hours' is an apocalyptic drama that takes place over the final twelve hours before a cataclysmic event is set to wipe life off of the planet. Nominated for the Golden Camera award at the Cannes Film Festival, 'These Final Hours; showcases the last day on earth, twelve hours before a cataclysmic event will end life as we know it. James (Nathan Phillips: 'The Bridge', 'Wolf Creek') makes his way across a lawless and chaotic city to the party to end all parties. Along the way, he somewhat reluctantly saves a little girl named Rose ('Angourie Rice': 'Worst Year of My Life, Again') who is desperately searching for her father. Stuck with the unexpected burden of responsibility, James is forced to come to terms with what really matters in life as the final hours tick away. The 'These Final Hours' competition has now closed. Winners will be announced shortly. Competition opens at 5pm AEDT on Sunday 7th December 2014 and closes at 11:59pm AEDT on Sunday 14th December 2014. Five winners will be chosen at random on Monday 15th December 2014. To successfully win, entrants must fulfil the above entry conditions before the time the competition closes. Current members/followers are eligible to enter the competition. Only one entry per person. Only one winner per household. To be a valid winner, the entrant must not have won a prize from SWITCH within the last 28 days. Each winner will receive one Blu-ray copy of 'These Final Hours'. By entering, you agree to receive occasional emails from SWITCH in the future. If you decide to unsubscribe from these updates, any further entries will not be applicable. Only Australian residents are eligible to enter. 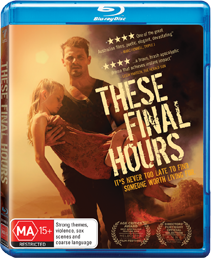 'These Final Hours' is available on Blu-ray, Digital and DVD on Wednesday the 10th December 2014 from Roadshow.